Life Story Archives | Africa Surgery, Inc.
Aminata Kamara, 37, was disabled by polio as a child. 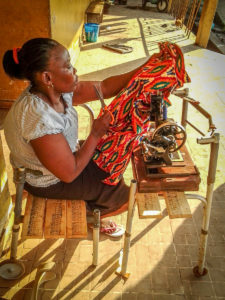 Years ago, Aminata earned a certificate in tailoring at vocational school, but she never managed to acquire a sewing machine. She could only do piece-work in other tailors’ shops, and only if a machine equipped with a hand crank was available. Africa Surgery gave Aminata a sewing machine, powered by hand, which was donated and shipped from Holland. Africa Surgery also designed and built an adjustable table and chair for her, using 2 surplus walkers and some boards. Aminata, who lives with her husband and two children on a settlement for polio victims, now is able to work from home. 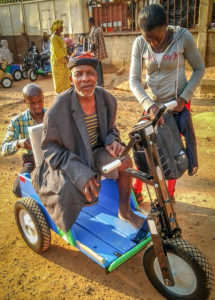 Last week Africa Surgery distributed mobility carts to 10 disabled people in the town of Kabala, about 190 miles from Freetown. One of the recipients was Bafudia Kabalo, a 65-year-old man who had lost his left leg six months earlier. Bafudia’s daughter/helper, in the picture, brought him to Bafudia. He will now be able to transport himself, his tools and his produce to and from his field. 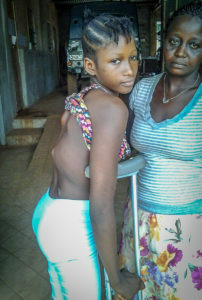 When Esther Tenneh Sesay, now age 16, first came to us in 2016, her spine was deforming due to a tuberculosis infection caused by a kyphosis fracture of her spine. She was in pain, and her legs were already paralyzed to the point where she could only stand with the support of her mother. 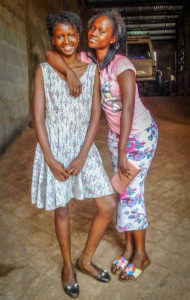 On October 15 , Esther returned to our base in Freetown with her older sister. Now out of pain, Esther wanted to show us how she is able to stand on her own while she even lent some pretense support to her healthy sister. Africa Surgery had sent Esther and funded her treatment at the hospital of the Foundation of Orthopedics and complex Spine (FOCOS, www.orthofocos.org) in Accra, Ghana. There Esther underwent halo traction treatment and multiple surgeries. She has regained most of her neural function and is on track for a full recovery. 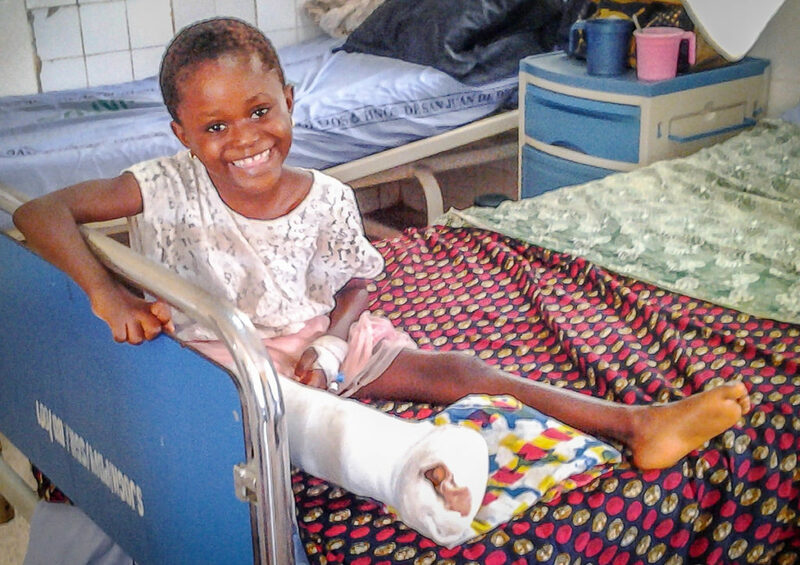 Esther is one of 13 patients sent in 2018 by Africa Surgery to FOCOS in Ghana for successful complex spinal surgery. David Dominic Grant, 16, has been living with an unrelated guardian since becoming an orphan in his early childhood. David is a hard-working student who always ranks first or second in his class standing. David’s guardian is a primary school teacher who, like many teachers in Sierra Leone, does not receive a salary because the government has not yet registered her as certified, and this after eight years of voluntary work. She can only get money by doing private tutoring or selling goods in the market. For the past several years, through Africa Surgery’s student-sponsorship program, David has been getting support for his schooling from husband-and-wife donors in America. Africa Surgery had already been paying the rent on the small house shared by David and his guardian. But David has often attended class on an empty stomach. So, recognizing that “an empty bag cannot stand,” we began to subsidize his feeding with extra funds provided by his generous sponsors. 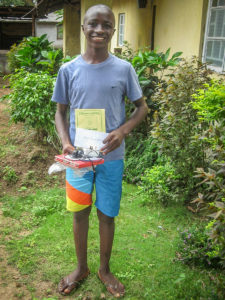 David is one of over 100 students receiving help to attend school through our student-sponsorship program. We are a unique organization in that we use 100% of of the funds donated here for the medical and surgical care of Sierra Leonean children and adult patients. No part of these funds go for administrative costs.